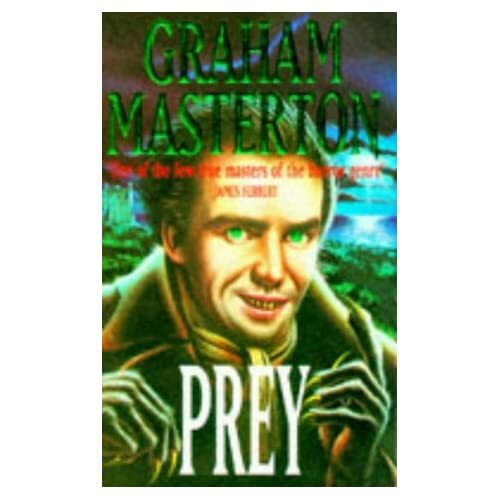 Graham Masterton: Prey | Vault Of Evil: Brit Horror Pulp Plus! Since I've started reading horror again I had already gone through my mind and listed the authors I remembered from a misspent youth: Guy N. Smith, John Saul, Blatty etc. And so I dug into Prey after having read some Layman and Koontz. I was altogether happy with initial reads, so this I hoped would be something better. And was it ever! 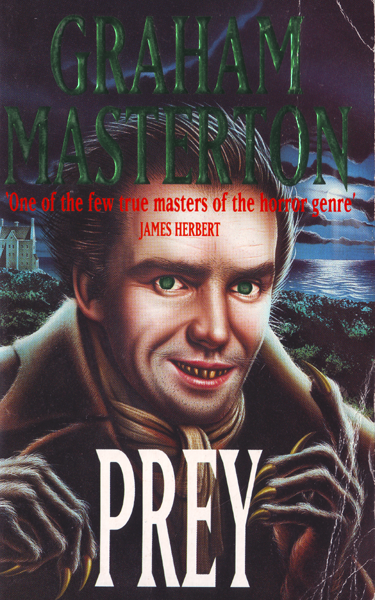 Of the (very few) authors I had thus far revisited, Masterton was, from the outset, the best writer. While he liked to spend time in long descriptive passages they were honed to creating atmosphere or tension. The characters were (mostly) believable, and the setting was nicely strange. Better yet, Masterton starts the novel without any pretense or hesitation. The opening paragraph ends with "scuffle-scuffle-scuffle. Then silence again." David is lying in bed, and he can here these noises coming from the attic. Later he hears it in the walls, under the floor, all over the house. Is it just rats, or something more? Without giving spoilers let's just say there is plenty here to keep you hooked as each page comes along. Masterton is, well, a Master at what he does. On top of all that there us plenty of strange things going on to keep us entertained. The climatic scenes are fun too, as the book takes a wild ride and turn that I wasn't expecting. If this were a movie script the necessary budget to film it went from 10 million for the vast majority o the book, to 100 million in the final 100 pages. terrific - and so very over-the-top. Just what the doctor ordered. Downsides? Well not many. The plot does get rather complicated, and frankly I tried to explain it to my wife but had trouble getting her to understand it - you've really just got to read the book. At 347 pages it's not too much of a hardship. Other than that the book was class, and I enjoyed it very much. ps: Sorry for the terrible cover scan, but I took it from Amazon! Found this at home recently and dived in. What Vaughn says goes. 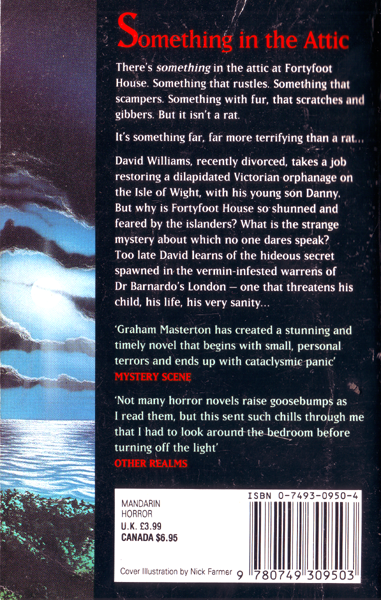 Masterton does Lovecraft on the Isle of Wight. Haunted house story with dashes of gore, spookiness, middle-aged man wish fulfilment (I'm not complaining about that - send for Globeswatch!) and a general air of mystery. Although not a Lovecraft aficionado, I did pick up on Brown Jenkin, referred to as Brown Johnson by hero David Williams for a while.There's digs at James Herbert (whose praise for GM adorns that bizarre shiny, is-it-great or is-it-crap cover) and GNS, and unless I'm very much mistaken (yes, you are) very veiled references to Carry On Up The Khyber and Hitchcock's Frenzy. It's difficult not to like top-hatted madmen changing position in photographs,houses that seem to change shape, portals to other times and muttering villagers. Why did GM need to point out that the librarian is plain but voluptuous at least three times? About halfway through, with no idea where it's going to go. There's something in the attic of Fortyfoot House. Something that rustles. Something that scampers. Something with fur, that scratches and gibbers. But it isn't a rat. It's something far, far more terrifying than a rat. Found copies of Prey, Family Portrait, Spirit and The Hymn on friend Back-of-the-van man's stall ages back. Still not got around to any of them. Above comments have persuaded this is a good one to start on. Cover painting is certainly ... something. I'm sure someone here will put me right if I'm wrong, but wasn't this the book where poor Stateside sales were wholly blamed on the parochial setting? Ever since which Masterton has purposefully set all his novels in America. A shame if its true as the Isle of Wight is a singularly creepy captivating place; what with its sunken Roman ruins, pagan Mottistone, fossil rich cliffs and the spooky urban legend of Lucy Lightfoot and the timeslip at Gatcombe church. Had the best holidays of my childhood on the IoW [even if I did fall in a river there at the age of five and nearly drown]. Whew! What a lunatic novel. It doesn't quite scale the heights of Laymon's Funhouse, but it certainly has a go. I might try to put a proper list up later but it does feature some bizarre product placement such as Kellogg's Country Store Muesli (unavailable in the US) and Brut 33 - where were you in '92? I always thought GM was American (probably because of The Manitou) and there's a few US spellings in the text (such as color) although the setting and many characters are almost cartoonishly English - no pub landlords, but an hilarious vicar and nice old lady who runs the beach cafe (SPOILER - and meets a horrible end) plus some cliched coppers. The 300 or so pages fairly flew by.